The Display Posts Shortcode allows users to easily display listings of posts. Add the shortcode in a post or page, and use the arguments to select based on tag, category, post type, and many other possibilities. There are also some extra options to display something more than just the title: include_date, include_excerpt, and image_size. You can also display the list in a Text Widget. See Embed Codes in widgets for details and examples. The display-posts-shortcode Wiki on GitHub gives more details. An easy way to find out the id of a page: In the page editor, click Get Shortlink, this will open a dialog with a link, the number at the end is the post id. Here we include an excerpt and the date and limit the number of posts to three. Glow Blogs Update (3/16/2018)- Glow Blogs had a small update this week: WordPress – 4.9.2 > 4.9.4 event-organiser plugin – 3.6.2 > 3.6.3 google-language-translator plugin – 5.0.33 > 5.0.43 wordpress-importer plugin – 0.6.3 > 0.6.4 These were small maintenance and bug fixes. They should not affect the majority of Glow users. WordPress Update (9/28/2017)- Glow Blogs have been updated from WordPress 4.7 to 4.8.2 The main features in this update: New Widgets There are new Text, Image, Audio & Video widgets More details and examples. Improvements to adding links Adding and editing links is now a better process. See the Version 4.8 on WordPress Codex for more details. And here we don’t have a list but put each post in a div. We can use some custom css, this is added via the Jetpack Custom CSS module. If your posts use featured images you can use them too. 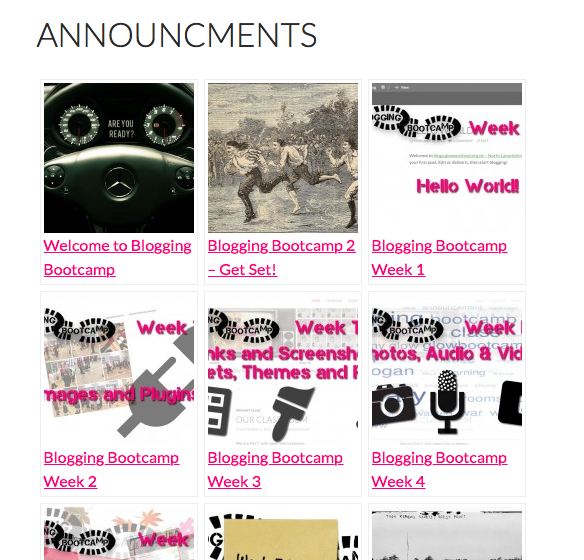 Here is an screenshot example from the Blogging Bootcamp #2 blog.